Of course, we scrapbookers all know about the demise and downturn of scrapbooking magazines in the past few years. We’ve lost Simple Scrapbooks, DIGITAL SCRAPBOOKING, and MEMORY MAKERS. We’ve seen changes to the number of issues with SCRAPBOOKS ETC. and Creating Keepsakes. For some down and dirty facts, check out this report about the 2009 scrapbook magazine industry … PART ONE, PART TWO, and PART THREE. 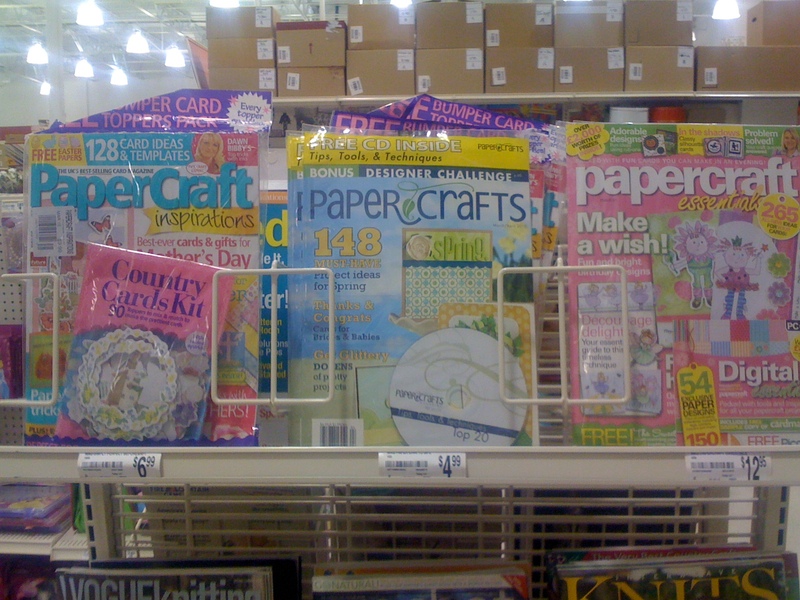 When I was at Michaels recently, I noticed that the papercrafting and cardmaking magazines don’t seem to be suffering the same fate. And what the hell is up with that?!?! As “our” magazines dwindle, theirs seem to be multiplying. Keep in mind that even more magazines are hidden behind the ones that are showing. The magazine rack at Barnes and Noble looks similar. Admittedly, I haven’t read through the 3 long “state of the industry” articles I linked to above. Maybe the answer is in there, but skimming them, I didn’t find it. New Albums, K&Co., and Making Memories at Michaels	Great Sale on Scrapbook Idea Books, Past Magazine Issues, Etc. There do seem to be less and less scrapbooking magazines out there. I have check through all of them. I am not familiar with the beading magazines. But I am wondering if the designers of the scrapbooking mags were getting paid so much that the magazines couldn’t afford them. Just a thought that came to me. Here in Canada we have 1 Scrapbooking magazine. It is high quality, little advertising and features everyday scrapbooker around Canada. I totally love this Magazine. This is the only one I buy. It only comes out 4 times a year though. Are some of those cardmaking and papercrafting ones from bigger families of magazines? I would imagine it’s harder for the smaller publishers to stay afloat than ones with a wide portfolio of titles. I think it might be easier (and maybe less expensive) to jump right into the papercrafting world than the scrapbooking world. It seems like I meet new scrappers every day though! I wish the scrapbooking magazines would just put more everday people and layouts into it. I honestly get tired of seeing the same faces and people. It’s like they make Scrapbooking “Stars” out of the people and that makes it more about them than “scrapbooking”…magazines like Papercrafts can give you ideas you can use on your layouts. I do think a lot of people are now getting into card making, but I can’t see how it’s any bigger than scrapbooking. I’m not sure what’s gonna happen it with it all. We don’t have any local scrapbook stores where I live anymore. I am very sad about it! I am just filled with wisdom. . . meaning I’ll admit I don’t understand enough about it to make an educated guess as to what is happening or will happen. LOL I do know that I want my faves, CK and SBEtc, to survive this and come out on top. Well, I consider scrapbooking a sub-genre of paper crafting. The thing about paper crafting mags is that they can include things that interest a broader range of people all in one pub. And card makers are often referred to as ‘stampers’ and are sometimes not at all interested in scrapbooking and other times full on into it, it just depends on the person, but you are, again, attracting two groups. Scrapbooking is a singular genre, making a bit harder to market. Personally…I reach for mags with more variety now more than ever because I’m limited as to how many I can purchase. I think most of the general paper crafting magazines are doing well because they usually have many paper craft projects (cards, Mini Albums, Layouts and DIY projects). Also, many of the magazines showed above, are widely distributed in Europe which I’m sure helps them financially. I know “Crafts Beautiful” is very popular there and is part of a bigger craft magazine company. Hi, Love your blog…I gave you a blog award…stop by my blog to pick it up! 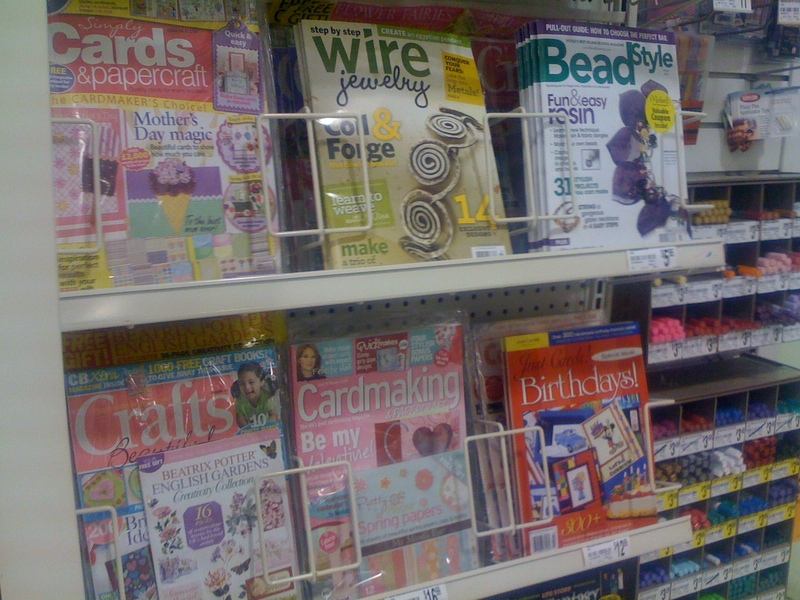 I really do love the cardmaking and papercraft magazine from the UK. For these reasons. You get a mag that really shows you in detail how to make the items and gives you the list of the things that are needed to make that item. Also, you get a gift with it. Which I have to say are very nice. I was getting all my mag and still get some from the US, but since they are not printing the ones that I really liked they gave me no choice, but to get a different mag elsewhere.